As we continue our supernatural theme in honor of Halloween, we also have a review this week of Blood Bath & Beyond by mystery/vampire author Michelle Rowen and an interview with Michelle. At the end of this post are details on how to win a copy of the book & a link to purchase it from Mysterious Galaxy which helps an indie bookstore & KRL. Sarah’s engaged to an older man—about six hundred years older. He’s a master vampire with age and comes with a lot of baggage. Still, Thierry has evolved even if opening up about his past isn’t one of his new strengths. When Thierry’s offered a job by the Ring, the governing body of vampire behavior, it’s a job he can’t refuse, even if it means working with Bernard, a former vampire friend and current enemy. Bernard and his wife Laura, Sarah and Thierry meet in Las Vegas to handle a problem and to let Thierry sign the paperwork (in blood of course) for his new job. Things go fairly smoothly unless you count the number of dead humans found around Vegas lately. So far, the score is one a day. Is there such a thing as a vampire serial killer? Since all the victims have two holes in their necks, we guess so. Thierry’s job also includes dealing with a vamp who is drawing too much attention to herself. Someone is bound to notice that she never ages—beyond six years old. It’s the toddler beauty pageant circuit and after a number of wins, somebody’s going to call foul. When Bernard is killed by a vampire hunter in plain sight of an enforcer, a crowd of humans and Sarah and Thierry, Thierry is the prime suspect, having talked to the hunter and threatened Bernard. He’s put under house arrest and it’s up to Sarah to discover the truth about the murdered humans, Bernard’s death, the hunters, and the toddler. A nice look at Vegas complete with the store, Blood, Bath and Beyond for vamp wanna-bes and a secret door that leads to a legit blood bar for the real thing. Lots of humor, especially when Victoria, the mini-vamp is around, danger when Sarah gets in over her head (often) and sizzling passion when Sarah and Thierry are together (whew!). Previous books connected to the Immortality Bites series: Bitten and Smitten, Fanged and Fabulous, Lady and the Vamp, Stakes and Stilletos, Tall, Dark and Fangsome. Blood Bath and Beyond is technically a stand alone but now makes me want to read the first five as well. Michelle: I’ve been writing for pretty much forever…since I was a kid. I’ve been writing “seriously” for about ten years. 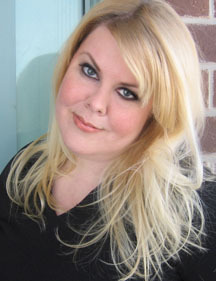 Michelle: My first novel came out in 2006 and it was called Bitten & Smitten, a paranormal romance about a woman who gets turned into a vampire by a blind date from hell and must deal with the pitfalls and dangers of being a bloodsucker in a world full of slayers and other enemies. This first novel was my intro of the character Sarah Dearly who is also the heroine of the spin off mystery series that’s just begun with Blood Bath & Beyond. Lorie: Have you always written vampires? If not what else have you written? Michelle: I’ve always written about vampire, since my first book and also my most recent book is about them (the same vampire, actually!). I’ve also written many other books about demons, angels, werewolves, witches, and many other creatures that go bump in the night. Michelle: After I finished my original paranormal romance series in 2009, I thought I’d heard the end from those characters. I was wrong. Almost immediately, the main character, Sarah Dearly, started talking to me again — she wanted me to write more books about her. New books, new series, new genre…mystery. Eventually, I agreed. 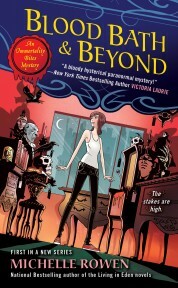 While it could be argued that Blood Bath & Beyond is a continuation of the original series about a twenty-something fledgling vampire and her much, much older master vampire fiancé as they hit the road, working for the vampire council to investigate vampire-related crimes, it is officially “Book #1” of the new series, Immortality Bites Mysteries, and no prior knowledge of the characters is required. Michelle: First and foremost, I write to entertain! But, I think if it was only that it wouldn’t hold much weight for me as a career. Even in my lightest books there is a message — perhaps something as simple as “love conquers all” or “good is stronger than evil,” but something’s there as a theme that I hope resonates with readers. Michelle: I write a few books a year so I need to be pretty strict about my writing schedule. When I’m in ‘first draft mode’ I usually aim for around 10 pages a day and am very consistent about this — even if it takes me till midnight to get ’em! Michelle: I found it difficult finishing a project to the point that I would be ready to try to get an agent. I procrastinated on this for a very long time. However, when I finally did finish a book, I found an agent and a publisher surprisingly quickly — it was the right time and the right place for vampires back in late 2004 when I sold my first book! Michelle: To keep writing fun books and hopefully keep my readers happily turning the pages! Michelle: I used to say “as little as possible, that’s why I write fantasy!”, but that’s not really all that accurate. For any book there’s going to be some amount of research. Usually I need to research the location I set the book to make it feel authentic, especially if I’ve never been there in person before. I have been doing a great deal of research on medieval times in order to make a high fantasy series I’m writing under a pen name feel as authentic as possible. Thierry, the hero of my Immortality Bites Mysteries series is over six centuries old, so I need to do some historical research to help his timeline and experiences make sense. If something comes up and I don’t feel comfortable with how much I know about it to help it come alive on the page, I spend some time researching the subject matter. Michelle: Lately, mostly urban fantasy and paranormal YA novels. Favorite authors include Karen Marie Moning, Richelle Mead, and Julie Kagawa, to name but a few. Michelle: Off the top of my head for TV: Supernatural, Dancing with the Stars, Project Runway, Vampire Diaries, Game of Thrones, and Dexter. Michelle: Write what you love, and write because you love it and you want to tell a story. And don’t give up. Seriously, just don’t. Michelle: My website is www.michellerowen.com, Twitter is www.twitter.com/michellerowen, and Facebook is www.facebook.com/michellerowenbooks. Michelle: Definitely not an easy thing! I suppose the only thing I can do is to write the best book I can, try to reach out to readers through social networking and my website, and hope that they find my book and enjoy it enough to try another one! To enter to win a copy of Blood Bath & Beyond, simply email KRL at life@kingsriverlife[dot]com by replacing the [dot] with a period, and with the subject line “Bath”, or comment on this article. A winner will be chosen October 20, 2012. U.S. residents only. Michelle, I am so glad you have decided to bring back these characters I lovee so much in this new series!! I enjoy the series and would love to win this book. Thanks for doing this giveaway.